Tickets are on sale now to see The Ferryman at the Bernard B. Jacobs Theatre on Broadway. Jez Butterworth's smash hit play The Ferryman, directed by Sam Mendes, transfers to Broadway, where it began previews on October 2, 2018, and officially opened to rave reviews on October 21. The Ferryman became the fastest-selling show in the history of London's Royal Court Theatre and, following a sold-out run at the venue in spring 2017, the epic drama - both in concept and scale - transferred to the Gielgud Theatre for a twice-extended run in the West End and continued to garner critical acclaim and a plethora of accolades, including the Olivier Award for "Best New Play". Although The Ferryman is laced with the intricacies of the political unrest of the 1980's in Northern Ireland - a time referred to as 'The Troubles' - no prior background knowledge is necessary to feel moved by this exquisitely written portrait of a family in crisis. The play's central themes of love, loss, and grief will resonate with you, no matter where you're from and no matter what your background. The family in question is the Carney family and we join them at their rural farmhouse as they are about to celebrate the annual harvest. But as this multi-generational, extended family gather together, secrets of the past are unearthed in a living tapestry of lies, betrayals and hidden truths. 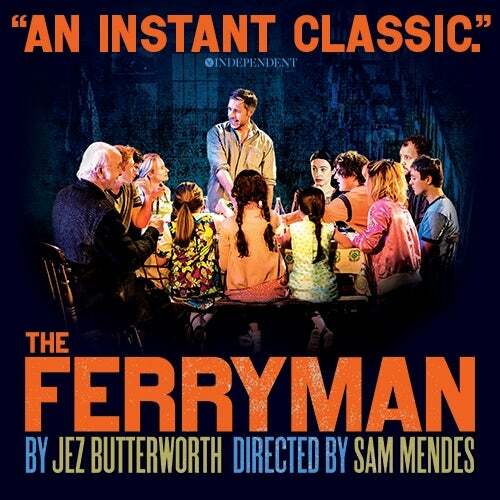 As has become somewhat of a signature for Jez Butterworth, whose previous Broadway credits include the Tony-nominated masterpiece Jerusalem and the Hugh Jackman-led three-hander The River, The Ferryman is at times lyrical and mystical in its writing, drawing inspiration from Irish mythology. This element is anchored by the character of Aunt Maggie Far Away, who drifts in and out of dementia to regale younger members of the family with stories of old and prophecies for the future. She even forewarns of the fate of the Carney family, as the figurative tidal wave moves ever closer to the farmhouse by the play's conclusion. With a huge ensemble cast - that also includes babies, rabbits and geese - all the pieces of this extraordinary puzzle receive their moment in the spotlight and come together with a pace that creeps up on the audience, catching us off-guard at every twist and turn. So many of Butterworth's characters are relatable - even in their extreme views or circumstances. You understand their pain, their motivations and their searing loss. After 3 hours and 15 minutes - which all too tellingly fly by - you feel a part of this family, inextricably woven together. The Ferryman is a theatrical experience unlike any other in recent Broadway history - as utterly shocking as it is enchanting. Allow yourselves a trip across the River Styx to the Bernard B. Jacobs Theatre, courtesy of The Ferryman, and let your wandering soul be fulfilled. Brian d’Arcy James (as Quinn Carney), Holley Fain (as Caitlin Carney), Emily Bergl (as Mary Carney), alongside Fred Applegate (as Uncle Patrick Carney), Ralph Brown (as Muldoon), Charles Dale (as Father Horrigan), Sean Delaney (as Michael Carney), Jack DiFalco (as Shane Corcoran), Ethan Dubin (as Olsin Carney), Fionnula Flanagan (as Aunt Maggie Faraway until Apr 28), Blair Brown (as Aunt Maggie Faraway from Apr 30), Shuler Hensley (as Tom Kettle), Terence Keeley (as Diarmaid Corcoran), Collin Kelly-Sordelet (as James Joseph "JJ" Carney), Matilda Lawler (as Honor Carney), Michael Quinton McArthur (as Declan Corcoran), Willow McCarthy (as Mercy Carney), Ann McDonough (as Aunt Patricia Carney), Julia Nightingale (as Shena Carney), Brooklyn Shuck (as Nunu Carney), Glenn Speers (as Lawrence Malone), and Graham Winton (as Frank Magennis). The Broadway premiere of Jez Butterworth’s smash-hit play The Ferryman, directed by Sam Mendes, welcomes a whole host of new cast members to the Bernard B. Jacobs Theatre tonight, including three-time Tony Award nominee Brian d’Arcy James, who assumes the role of Quinn Carney from original cast member and Olivier Award nominee Paddy Considine. Mr. d' Arcy James has earned Tony Award nominations for his performances in Something Rotten! (2015), Shrek The Musical (2009), and Sweet Smell of Success (2002). He was last seen on the Great White Way as King George in Hamilton in 2017. The Broadway premiere of Jez Butterworth’s smash-hit play The Ferryman, directed by Sam Mendes, is set to welcome a whole host of new cast members to the Bernard B. Jacobs Theatre from February 19, 2019, including three-time Tony Award nominee Brian d’Arcy James, who'll be assuming the role of Quinn Carney from original cast member and Olivier Award nominee Paddy Considine. 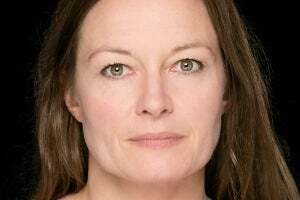 Olivier Award nominee Catherine McCormack is set to join the company of the Broadway premiere of Jez Butterworth’s smash-hit play The Ferryman, directed by Sam Mendes, assuming the role of Mary Carney at the Bernard B. Jacobs Theatre from December 18, 2018. Original cast member Genevieve O’Reilly is set to play her final performance on December 16.